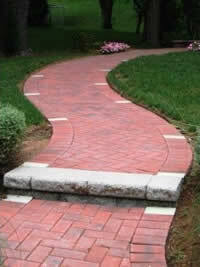 Installing pavers and concrete stones has come a long way since they were introduced. It is no longer necessary to have a bland pattern. As well, many companies have introduced low voltage lighting pavers, as shown in Figure 1, which can be integrated into many paver or concrete stone designs. Additional information on paver patterns and designs. 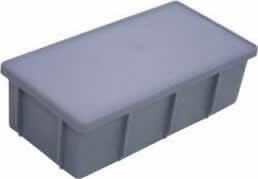 To enhance your paver or concrete stone driveway, walkway, patio or pool deck numerous manufactures have created low voltage (12 VAC) light fixtures that replace the standard residential 4” X 8” X 2 3/8” paver. These systems are available as individual light fixtures and lenses, as shown in Figure 2, that can be added to a current low voltage lighting system or in kits that include or in kits that include a number of light fixtures, lenses, transformer and cable. 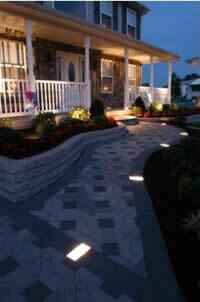 Figures 3, 4 and 5 show paver lights integrated into a paver constructed walkway. 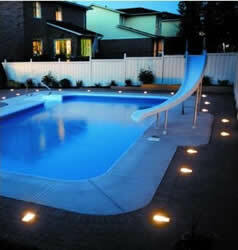 Figure 6 shows paver lights integrated into a paver constructed pool deck. Figure 7 shows paver lights integrated into a paver constructed steps. 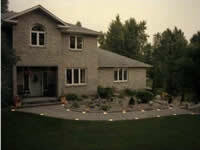 Figure 8 shows paver lights integrated into a paver constructed driveway. 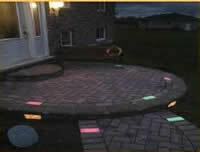 Figure 9 shows the use of different color lenses on the low voltage paver light fixtures. Although most low voltage light systems suggest that you can directly bury the cable a few inches under the soil I always recommend the use of PVC electrical conduit. My personal experience with underground direct burial wires is that they are magnets and attract shovels, spades, pitchforks and all other digging implements. Low voltage lighting systems are not inexpensive and the cost of a few feet of conduit to protect the wiring in my opinion is a sound investment. As with any low voltage lighting system sizing the wiring is one of the primary keys to having a successful installation. 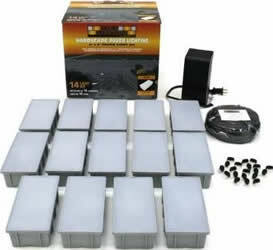 Additional information on how to wire outdoor low voltage lighting systems.